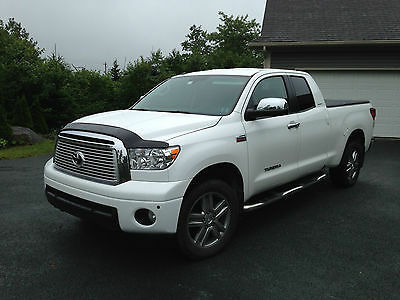 I am the one owner of this Tundra. I meticulously care for my vehicles and it shows. This tundra is like new with only 15400 miles ( 25000km) This is the fully equipped LIMITED TRIM model including factory navigation and leather. It also has the factory 20" wheel option and a spray in bed liner (Line-X). The Tundra was purchased new at Amherst Toyota in June 2014 so it stilI has almost 2 years of comprehensive warranty and almost 4 years of powertrain warranty. I will accept a 1000.00 paypal deposit and the balance in person upon pickup. I will gladly meet you at Halifax International Airport (YHZ) for pickup. Please contact me with any questions.